Every month this semester, The Lab Report will feature a different undergraduate-research assistant on campus and their experience in the lab. Most students on campus walk into work everyday hoping that mold hasn’t infested their left-over dishes. But junior microbiology student Andrew Sukowaty isn’t most students. 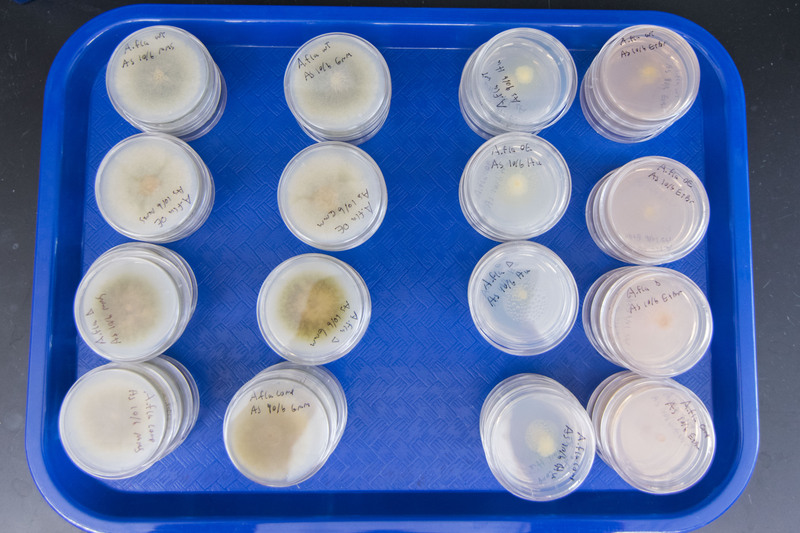 The lab specifically experiments with growing the fungi genus Aspergillus to observe and regulate the production of aflatoxin, a poisonous metabolite that has become a rising threat to global food security. “It’s grown on me just because I’ve been working with it for a year,” Sukowaty said. 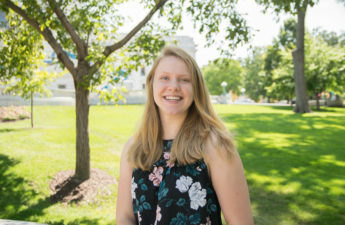 Keller was inspired to learn and conduct more research about fungal toxins after seeing the detrimental effects of Aspergillus firsthand as a young Peace-Corps volunteer in the south-African country of Lesotho, where she taught junior high school. According to the Food and Agriculture Organization, aflatoxin affects 25 percent of the world’s crops before, during and after harvest. The most vulnerable, however, are those living in sub-saharan Africa, where aflatoxin contaminates staple food crops such as corn, sorghum and peanuts, according to a study by the United Nations. Keller believes this issue is a serious medical problem in the developing world. Developing countries, however, are not the only ones experiencing the wrath of aflatoxin. In the U.S. alone, aflatoxin costs the corn industry $225 million per year, according to a report in APS. 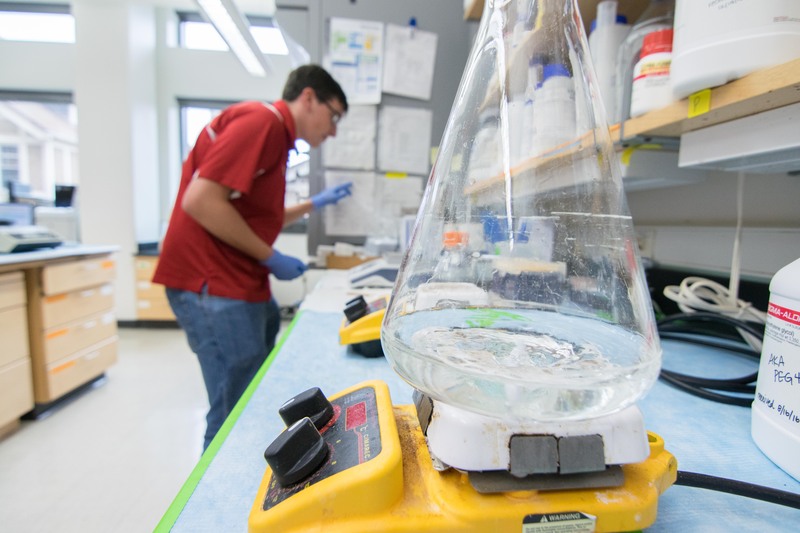 In efforts to lessen these impacts in the future, Sukowaty and his mentor, Brandon Pfannenstiel, are currently experimenting with removing or keeping one of the proteins called sntB in fungus A. flavus, which they believe is responsible for the release of aflatoxin. But the absence of sntB in A. flavus doesn’t just affect aflatoxin production, it also affects the fungus developmentally, he said. This means that scientists could potentially manipulate physical characteristics such as reproductive structures. In one experiment where Sukowaty deleted sntB from A. flavus, he noticed the fungus did not form sclerotia — rounded bodies that grow on the fungus and hold sexual spores. And, just like changing the medium on which an artist paints affects the image, changing the media on which A. flavus lives inside petri dishes affects its growth. Sukowaty looks over the petri dishes of A. flavus he is currently growing on different media, mainly glucose-minimal media–a “Keller lab standard”–and potato dextrose agar. On these media, Sukowaty grows up his genetic variations of A. flavus, called strains. The strains either contain or do not contain sntB — all which, depending on the media, affect the growth of A. flavus differently. A (left) deletion strain of A. flavus–without sntB–in comparison to a (right) wildtype strain of A. flavus–the natural state of the fungus, which contains sntB. By continuing to develop methods that weaken development of A. flavus and production of aflatoxin, the Keller lab hopes to lessen the toxin’s impact on food crops and people in developing countries. Because A. flavus easily contaminates with its airborne spores, sometimes Sukowaty has to start experiments over if he notices abnormalities in them, which takes two weeks to appear. Sukowaty also recalled he and Pfannenstiel once deleted sntB from A. flavus thinking it would prevent creation of aflatoxin, but it still produced the toxin — only in small amounts, however. Despite the tediousness of working with fungi, the junior bacteria-enthusiast encourages younger undergraduates not to be stingy when choosing labs. And for Keller, enthusiasm is most important in a potential research assistant.